Remember the Good Old Days? They're Back! Why the U.S. economic data are better than you think. NEW YORK (TheStreet) -- The mainstream business media continue to worry about a faltering economy, most notably of late, a fixation on the fear of a poor retail holiday shopping season. This makes one yearn for those good old days of a vibrant economy, like what we had in 2005-06. But wait! Except for the construction of new housing units and some problems measuring aggregate demand, the underlying data indicate that the good old days are back. 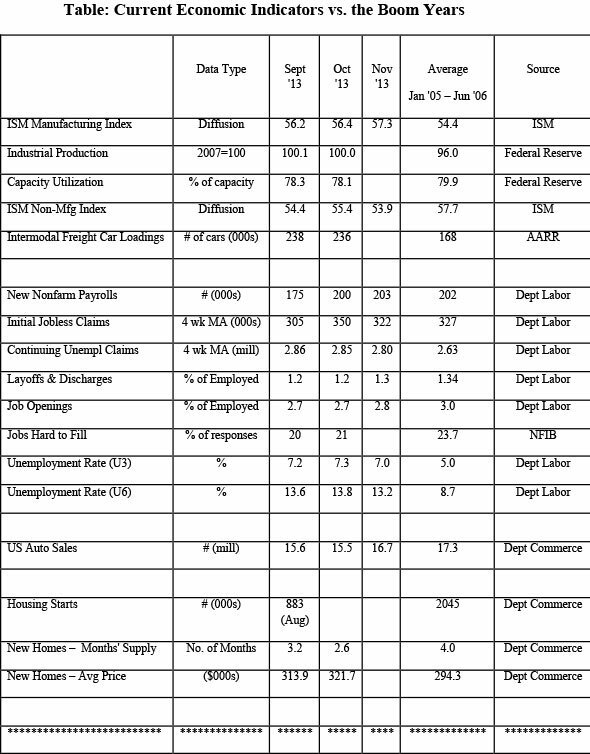 The top portion of the accompanying table shows various economic indicators for the three months ending in November, and it shows the average values of those same indicators during the 18 months of the pre-recession boom period ending June 30, 2006. The bottom part of the table is similar, but shows quarterly data. A quick perusal of the table shows that many of the economic indicators show up as strong or stronger than they were during the boom period. The ISM Manufacturing Index, for example, is nearly three points higher than the average of the previous boom. Industrial production is higher and capacity utilization is close. Freight car loadings are significantly higher. And while ISM's Non-Manufacturing Index isn't quite as hot as it was then, it still shows strong expansion. Elsewhere in the table, you can see that auto sales are nearly as frothy today as they were during the boom years. Because the unemployment rate indexes (see table) appear to be a lot higher today than in the boom period, the media assume that the labor markets are still loose. But demographics and incentives to work have changed over the past seven years. The labor subindicators in the table imply a much tighter labor market than the traditional unemployment indexes would lead one to believe. Recent new nonfarm payrolls are equivalent to their monthly gains back then. The most recent weekly initial jobless claims level was 298,000. It was below 300,000 for one week in September, but you have to go all the way back to May 2007 to find a number that low. Even the four-week moving average shown in the table is below the 2005-06 average despite the distortions from the government shutdown. Even the Continuing Claims series is approaching the 2005-06 average. And the Layoffs and Discharges, Job Openings, and Jobs Hard to Fill indicators are at or near their boom levels. So, while auto sales are booming, the labor markets are tight, manufacturing and services are expanding at or near their pre-recessions levels, why do the aggregates (Real GDP and Real Gross Domestic Income, GDI) appear so depressed. One possible explanation for the lag in the aggregates is a growing underground economy. When taxes rise and government regulations squeeze profit margins, more unreported "cash" sales occur, and there is an increase in barter (e.g., a manicure for an hour in the workout class). Furthermore, those collecting government aid (unemployment benefits, food stamps, etc.) may take employment at a lower wage rate if it is paid in cash and is not reported. In the end, the underlying economic indicators are much more reliable than the aggregated measures like GDP, as these tend to rely heavily on models, assumptions and guesses. There are many implications that occur when the underlying strength of the economy is finally recognized. The only one I will mention here is that while stock market corrections are normal, significant downdrafts like those of 2001 and 2009 don't occur with a strong underlying economy. Robert Barone (Ph.D., Economics, Georgetown University) is a Principal of Universal Value Advisors (UVA), Reno, NV, a Registered Investment Advisor. Dr. Barone is a former Director of the Federal Home Loan Bank of San Francisco, and is currently a Director of the AAA Northern California, Nevada, Utah Auto Club, and the associated AAA Insurance Company where he chairs the Finance & Investment Committee. Robert is available to discuss client investment needs. Call him at (775) 284-7778.